Friends of Grasslands (FOG) is a community organisation based in Canberra dedicated to the conservation of threatened grassy ecosystems through education, on-ground works and advocacy. These two draft amendments to the Plan concern significant grassy ecosystem remnants at Yarramundi Reach, Stirling Park and Attunga Point. Under our partnership agreement with the National Capital Authority, we have held over 30 work parties at these sites since 2009, contributing over 2,000 volunteer hours to conservation of these lands. It is with this significant experience of these lands and record of work for their conservation that we make the following comments and requests. 1. We congratulate the NCA on its far-sighted proposal to change the land use policy from “National Capital Use” to ”Open Space”, which will assist the conservation of the nationally endangered native temperate grassland ecosystem. 2. Removal of the notation on the Plan stating that the needs of the National Museum of Australia must be taken into account prior to a decision being made about the use of the site is timely and welcome. 3. We believe that the entire area should be re-surveyed to accurately map the areas that meet the criteria for listing as the endangered Natural Temperate Grassland, to identify priority areas for conservation. c. managed by measures to enhance natural values, including ecological burning. 5. We believe that this notation will not preclude planting and enhancing habitat in some disturbed areas to complement both the Pryor arboretum and the areas of Natural Temperate Grassland. 6. We ask that the grasslands are granted a suitable formal title on the Plan, for example, Yarramundi Reach Nature Park. 1. Securing much of Stirling Ridge by changing the land use policy from “National Capital Use” to “Open Space” is a most welcome proposal. b. A report prepared by Adam Myut for Wildlife Research and Monitoring of Environment ACT in February 2005 (map attached) reports Button Wrinklewort in two locations in quadrats that appear to cross the border of the proposed development envelope. c. The Rowell report for this NCA process maps modest areas of grassy woodland habitat within the proposed development area. We note that Rowell’s detailed survey quadrat for her report was located south east of the significant habitat reported above. The endangered Button Wrinklewort is difficult to locate, especially when it is not flowering or the understorey vegetation is thick, and it is not surprising that a viable population may not be located during a short survey. 3. It is also inevitable that long term impacts from the proposed development – such as weed invasion, fire control impacts and recreational disturbance – will degrade the high conservation value land immediately adjacent to the proposed embassies. If the access road were internal to the subdivision it is likely, for example, that some sort of access track will develop around the edge of the embassy development. Alternatively an access road around the edge of the subdivision poses a different threat since road verges around Stirling Park are conspicuously vulnerable to African Lovegrass infestation through vehicle and mower traffic. These types of threats would impact on the Button Wrinklewort habitats described in #2. 4. We urge the NCA to consider alternative ways of housing the greater numbers of missions, as 25 were originally was said to be required in the next 30 years. 5. In the undesirable case that the NCA recommends proceeding with the development we include the attached guidelines developed by FOG designed to limit the impacts of adjacent developments. We question whether many of these conditions could be applied and enforced in the case of diplomatic missions. 6. We do not support, and ask you to reconsider, allocation of Attunga Point as a possible future location for the Prime Minister's Residence. From our on-ground conservation activities in the area around the fenced area at Attunga Point and the knoll immediately south of Alexandrina Drive, we can demonstrate that the land has high numbers of the nationally endangered Button Wrinklewort and comprises the critically endangered White Box – Yellow Box – Blakely’s Red Gum Grassy Woodland that is in very good condition with high biodiversity. The Residence and mooted partial realignment of Alexandrina Drive could not proceed without destroying a portion of this population and Yellow Box – Blakely’s Red Gum grassy woodland, and further segmenting the remaining Button Wrinklewort population. FOG has monitoring records of Button Wrinklewort in conservation management Unit 4 in the gap between Units 3 and 5 near Alexandrina Drive, which is in the location where the road diversion would be required. We ask that this land is also rezoned as open space and not used for any development. 7. FOG believes that because a new Prime Minister’s Residence could be built within Lodge Park there is no requirement to retain the Attunga Point and Stirling Park area as an alternative option. We also consider that there may be an opportunity to develop such a residence within the current grounds of Government House. We ask that these options are fully considered and that Attunga Point not be retained as an option. 8. We welcome the removal of the National Capital Use area intended as an extension to Empire Circuit, passing through part of Stirling Ridge and the former Westlake community to connect with Alexandrina Drive. Road development would destroy a portion and further segment the remaining Button Wrinklewort population and Box-Gum Grassy Woodland ecological community. 9. The amendment text states that: “An investigation of impact on past use of the site by Indigenous people would be required.” It is FOG’s experience that the traditional owners actively use these lands to this day and consequently future management should involve them. 11. Similarly, the land in Section 2 zoned parliamentary purposes between State and Capital Circles contains a Button Wrinklewort population and White Box – Yellow Box – Blakely’s Red Gum Grassy Woodland. We ask that this land is also rezoned as open space. b. the land manager may continue controlled burning for ecological and fire fuel management. 13. We ask that the grassy woodlands are granted a suitable formal title on the Plan, for example, Stirling Ridge Nature Park. FOG is available to further elaborate on these points. To do so, please contact Dr Jamie Pittock, national lands volunteer project coordinator, on 0407 265 1321 or at Jamie.pittock@fog.org.au. FOG agrees that its name can be published, together with the information in its submission. 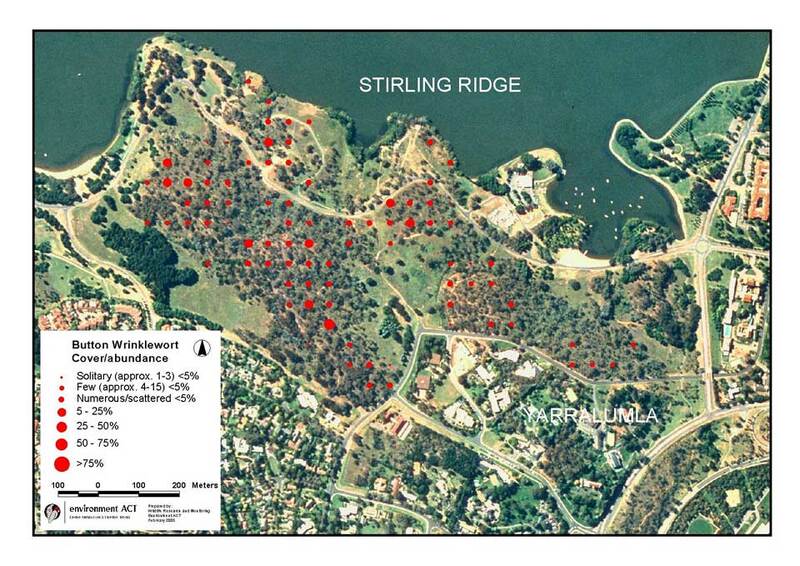 10 December 2012: Button Wrinklewort populations in the vicinity of proposed embassy development at Stirling Park: Draft Amendment 78. 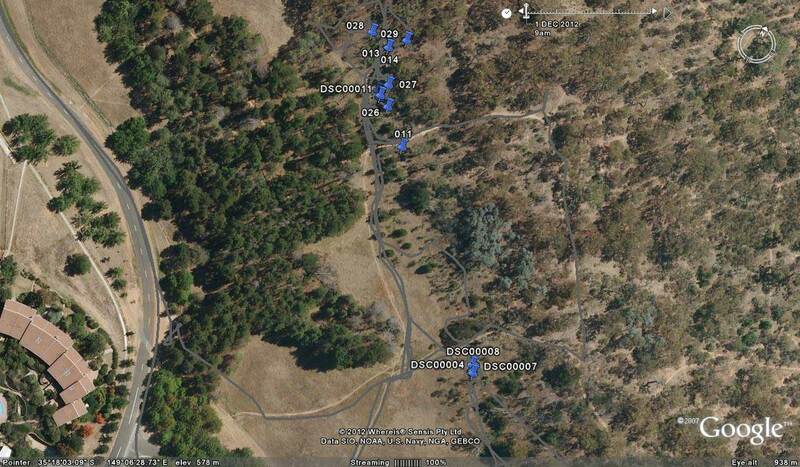 35°18.020’ 149°06.447’ 7 NE corner (WP12). Closest or on the border of the proposed development envelope? 35°18.074’ 149°06.523’ 11 Central east border (WP25). Close or in the development envelope? Grassy ecosystems are particularly vulnerable to soil disturbance and weed infestations, trampling through uncontrolled recreational activities, and lack of ecological burning from time to time. In undertaking developments close to high conservation value grassy remnants, FOG recommends adoption and enforcement of a range of environmental conditions, including the following. b. Alternatively, an internal access road may reduce access to grassy ecosystems but increase the risks of weed infestations from garden escapes and development of firebreaks and other access impacts on the boundary of the development. c. Landscaping parameters including approved non-invasive plant species and containment of pet cats.